This is a guest post by Wayne Stiles. He serves as an executive vice president at Insight for Living Ministries. His newest book, Waiting on God: What to Do When God Does Nothing, released this week. If you get a copy before August 25, Wayne will send you some free resources. Some days, I wish I’d never met Google Analytics. I mean, a couple of clicks shows me everything from my blog’s unique monthly visitors to what post a reader in Oslo is reading right now. It’s amazing! And honestly, it’s depressing. The metrics can get maddening—even addicting—when building a platform. After all, we’re building. And anything we pour our time, passions, and money into needs to prove its worth. We want to see progress. Daily. There’s an old saying that goes, “To everything there is a season, a time for every purpose under heaven.” Those words come from book of Ecclesiastes (way before the Byrds), and the verse goes on to introduce basic contrasts in life—birth and death, planting and reaping, weeping and laughing, and keeping and throwing away. Life is full of these contrasting “seasons.” And so is building a platform. You know what I like about those words from Ecclesiastes? They prompt us to keep the big picture in mind. Just as there are seasons in life, so there are seasons in platforms. Our problem, of course, is the waiting. We want the next season now. We want a staff of virtual assistants to free us up to create content. We want a team of videographers, editors, and Web geeks to do what we don’t do well. We want more time to develop more products, membership sites, and a podcast (or two). Sound familiar? Yep. Me too. 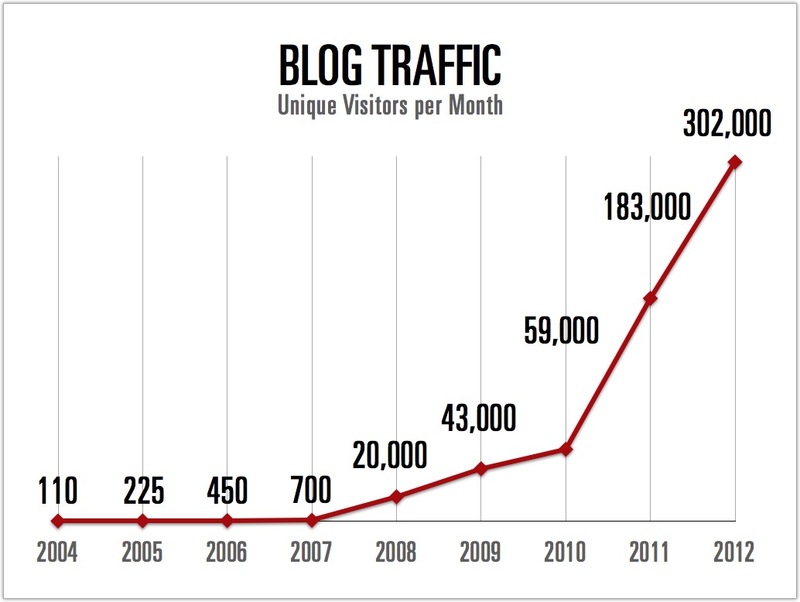 I keep bookmarked a post Michael wrote a few years ago that charts how his audience has grown since he began blogging in 2004. Although it’s tempting to focus on the right side of the chart, it’s the left side I stare at. When we do the mental metrics, we see it took Michael four years to get more than 1,000 monthly visitors. That’s right. Michael Hyatt had less than 1,000 readers for four years. A season of waiting preceded his inflection point. That was a long “season.” But it proved essential. It’s the same for us. As hard as it is to wait, the season of waiting offers us lessons we will value far more in the long run than if we had a larger platform now. “There’s no time like the present,” we’ll say. Often, that’s true. But let’s flip that saying on its head for a moment—and say it differently. As much as we want the next season of our platform now, we need to learn to see this season as a present—a gift. I think the biggest present a season of waiting offers us who have a modest platform is the time to refine why we’re building a platform to begin with. Think about it: Why are you blogging, writing, or speaking? What’s your goal or motive? Let’s probe a little deeper. Is there a reason behind the reason? What’s your why? I’ve seen it time and time again. People lose their way because they lose their why. One of the most important aspects of achieving the goals you set is to get deeply connected with your motivations for each one. It’s important we settle on our why early on—so that when the inflection point comes (or delays), the why won’t change. If our motive isn’t something we have a driving passion for, Google Analytics can derail us. In the beginning, our modest traffic can depress us—and tempt us to toss in the towel—and we never reach the inflection point. Then after the inflection point hits—and our platform gains momentum—the metrics can distract us and tempt us to focus on keeping those numbers. In either case, when the metrics become our why, we risk losing the very platform we started out to build. Any growth we experienced came because our readers, listeners, or audience resonated with our why. If we lose our why, it’s just a matter of time before we lose our platform. I’ll be honest. If growth alone were my primary goal, I’d give up. My platform never grows fast enough. It has to be about something bigger. That’s the why. This season of waiting is a present—a gift that allows us to deepen our commitment to why we do what we do. Whatever our why is, it alone helps us to keep writing, keep speaking, and continue building while we wait. Question: Why are you building your platform? Does it ever feel like it’s taking too long?